Why Is FanDuel Beating DraftKings In The NJ Online Sportsbook War? A battle for supremacy between DraftKings and FanDuel is not exactly uncharted territory. They’ve waged war in the daily fantasy sports space ever since DraftKings launched in 2012 as a competitor to the then-three-year-old FanDuel, peaking with a competition to see who could annoy more football fans with ads in 2015. Other than a brief cease-fire to almost merge in 2016-’17, this has been a pure rivalry, one in which any claim to the upper hand has proven temporary. In 2018, the rivalry relocated. Legalization and regulation of online and mobile sports betting in New Jersey set the stage for a new chapter — one that will ultimately have higher stakes than the DFS conflict. The DraftKings Sportsbook app became available in August. The FanDuel Sportsbook app followed in September. Who would prevail? At the end of 2018, it looked like a -110 bet on both sides. But not anymore. FanDuel is pulling away as the clear-cut No. 1 digital sportsbook in New Jersey. DraftKings was first to plant the flag, but for a variety of reasons, it’s getting further from first place every month. The New Jersey Division of Gaming Enforcement releases revenue statistics for each sportsbook every month, and together they tell the story of a pendulum that has swung significantly in just seven months. It’s been impossible the last few months to pinpoint exact numbers for DK and FD because each shares an online sports betting license with another skin; “Resorts Digital,” as it’s listed in the DGE reports, includes both DraftKings and BetStars (the sports betting arm of PokerStars), while the sites that make up “New Meadowlands Racetrack” digital include FanDuel and PointsBet. So the DraftKings and FanDuel figures are imprecise. But it has been estimated by those in the know that the DFS giants account for about 95% of their respective group’s financials, meaning the DGE numbers at least put us in the ballpark for DK and FD. Discounting August 2018, a month in which DraftKings posted $2.97 mm in revenue and FanDuel wasn’t operating yet, the first three months of this sports betting competition belonged to DK. 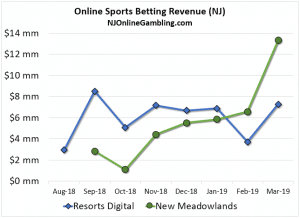 Resorts Digital beat Meadowlands online $8.51 mm to $2.85 mm in September, $5.09 mm to $1.11 mm in October, and $7.17 mm to $4.44 mm in November. Then it became almost a dead heat in December and January. Resorts (mostly DraftKings) still won both months, but only by $6.69-$5.53 mm and $6.89-$5.85 mm margins. The past two months, the script has been fully flipped. Meadowlands’ online sportsbooks became No. 1 in February, and it wasn’t all that close: FanDuel and friends made $6.86 mm in revenue, to just $3.72 mm for Resorts. And in the massive, Madness-filled month of March, Meadowlands reported online win of $13.32 mm, nearly doubling Resorts’ $7.28 mm. For about six months, being first to market mattered most. Now that the advantage has evaporated, FanDuel is winning for reasons that seem much more sustainable. FanDuel’s advantage starts with its land-based positioning. The FanDuel Sportsbook at the Meadowlands Racetrack is tops among New Jersey brick-and-mortar books by a comfortable margin, earning March revenue of $4.27 mm. There isn’t another legal sportsbook within 50 miles, and Meadowlands is the only logical choice for any bettors coming from the massive population center of New York City. By contrast, the DraftKings Sportsbook that opened in November is located at Resorts in Atlantic City, which ranks dead last in total gaming revenue among AC casinos over the first three months of 2019. Competing in that saturated market, DK’s b&m sportsbook earned $85k in March — or 1.99% of the profits at FanDuel’s land-based book. And it’s no secret that in states with both land-based and mobile sports betting, many patrons like to go to the land-based book for the atmosphere, but then do most or all of their betting on their phones from the comfort of their cushioned seats. Why get up and stand in line at a kiosk or, heaven forbid, interact with a human behind a window, when you can do it all on your device? Especially if you’re engaging in in-game betting, where you’ll sometimes have just a minute or two to pounce on newly posted odds, it’s all about the ease of mobile. 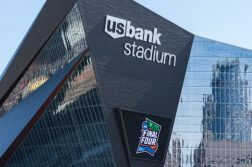 A crowded land-based sportsbook means more bettors placing online bets on that sportsbook’s same-branded mobile counterpart. That’s proving to be a huge edge for FanDuel’s digital offering. Both DraftKings and FanDuel have been buying up commercial time for their new online sportsbooks, but only one of the two has engaged deeply in the practice of earning additional attention by offering goodwill payouts. When FD had a glitch and posted an erroneous in-game line on a September 2018 Broncos-Raiders game, the company ultimately decided to pay out all 82 customers who got in a bet at the ridiculous 750/1 odds. FanDuel then built on that goodwill with another $82k in giveaways the next Sunday. When the Alliance of American Football collapsed before crowning a champion, FanDuel earned some cheap publicity by paying out every futures bet as if it had won. There were relatively few such bets, so this gimmick didn’t even cost the company $10k. Not only do high-profile freebies raise brand awareness, they plant the seed in potential bettors’ minds that they can win even on the occasional losing wager. For a new customer deciding which sportsbook to make a deposit on, that can be a deciding factor. While factors like this aren’t as quantifiable as those cited above, and are partially a matter of opinion, FanDuel Sportsbook’s more user-friendly app and generally more customer-friendly pricing probably account for some of its success relative to DraftKings. First, the pricing: You can cherry pick examples on either side. There are always certain games and certain futures where the best odds are at one site or the other, or are actually at PointsBet, Caesars, etc. But in general, across the numerous NJ Online Gambling articles since September comparing prices among the sites, FD has had the edge on moneyline and futures pricing more often than not. As for the platform, it’s entirely subjective to say one is better than the other. NJ Online Gambling’s site reviews rate FanDuel Sportsbook an 8.8 and DraftKings Sportsbook a 7.8. Others might disagree with the notion that FD’s interface is more aesthetically pleasing and easy to navigate. One factor that isn’t up for debate is that FanDuel’s full assortment of betting lines can be viewed by anyone, anywhere, whereas DraftKings’ lines require a log-in to view. So a customer who’s never created a DK account of any kind isn’t getting lured in by browsing lines and finding a juicy one. None of this analysis is meant as a knock on DraftKings Sportsbook, which is still a very clear and strong No. 2 in the New Jersey market. Nobody is saying they’re failing. They’re just not in first place anymore. There’s a parallel to what happened in the NJ iGaming space when that launched five years before sports betting. With its strong branding as Atlantic City’s most popular casino, Borgata stormed out to an early lead, launching casino first and teaming up with the well-known PartyPoker brand to start dealing iPoker first as well. But as others came along with superior offerings, the lead eventually went away. Golden Nugget is now the top revenue-generating online casino in the state, and Caesars (WSOP) and Resorts (PokerStars) are both ahead of Borgata in online poker. It’s good to be first. But over time, you need to be best if you want to stay on top.